The University of the Fraser Valley men’s basketball team saw its offence go ice-cold at an inopportune time, as the Winnipeg Wesmen reeled off a game-ending 18-0 run to steal an 82-76 victory in Game 1 of their Canada West first-round playoff series. Playing at Winnipeg’s Duckworth Centre, the Cascades had a phenomenal third quarter, out-scoring the Wesmen 24-10 to build a 13-point lead heading into the fourth. But the hosts dominated the final frame, holding the Cascades scoreless over the last 6:21 of regulation to claim a 1-0 lead in the best-of-three series. Game 2 goes Friday afternoon (3 p.m. CST / 1 p.m. PST, webcast at ufv.canadawest.tv). “We just lost the momentum of the game,” Cascades head coach Adam Friesen said. “All the energy in the fourth quarter started going towards Winnipeg, and we couldn’t find any way to stop it. Nav Bains was on fire to start the game – the Cascades’ fourth-year centre made his first four shots from the field to stake UFV to an 8-0 lead. The Wesmen answered with a 9-0 run of their own and would go on to build a 10-point lead in the first quarter, but Andrew Morris scored 10 points in the second as the Cascades got back to within 46-45 at the break. The third quarter was all UFV – the Wesmen were stymied by the Cascades’ 1-3-1 zone defence, and Morris scored the Cascades’ last seven points of the quarter as they took a 69-56 lead. Winnipeg opened the fourth with eight straight points, but the Cascades appeared to steady themselves with a 7-0 run in response, capped by an Anthony Gilchrist bucket in the paint off a feed from Mark Johnson. But those would be the last points UFV would score. The ball movement that had defined the Cascades’ third-quarter surge dried up in the late going, and when they did generate a good look, the basket seemed to have a lid on it. The Wesmen had no such issues – Lynch-Blair and Ryan Oirbans scored six points apiece in the game-ending run. Morris was outstanding for the Cascades, scoring 19 points on 8-of-13 shooting from the field. Four other UFV players scored in double figures: Manny Dulay (15 points, four steals, three assists), Gilchrist (12 points, 10 rebounds), Bains (12 points) and Vijay Dhillon (10 points, four assists). Lynch-Blair scored a game-high 23 points, Oirbans scored 21, and Sean Tarver chipped in with 18 off the bench for the Wesmen. The University of the Fraser Valley women’s volleyball team hadn’t tasted game action in nearly three weeks, and in the early portion of Thursday’s clash against the Columbia Bible College Bearcats, the rust was readily apparent. The host Bearcats thumped the Cascades 25-12 in the opening set, but UFV flipped the switch in the second, answering with a 25-10 blowout win of their own. The Cascades clawed out a 25-23 triumph in the third before wrapping up the match 25-14 in the fourth. Crosstown rivals UFV (8-15, sixth in PACWEST) and CBC (4-19, seventh) finish their respective conference schedules on Saturday, playing the back end of the home-and-home set at the Envision Athletic Centre (5 p.m. start, webcast at pacwestbc.tv). The Cascades’ bye week was followed by the cancellation of last weekend’s road trip to College of the Rockies due to dangerous road conditions. Head coach Mike Gilray told his squad not to use the lengthy layoff as an excuse for subpar play, and after working out some kinks in the first set, they excelled the rest of the way. “Tonight they (the Bearcats) came out flying – they were hitting everything hard and we were having a tough time controlling it,” Gilray said. “We knew they were going to come ready to play, and we weren’t able to match it at the start. Setter Jessica Funk and left side Rachel Funk, the Cascades’ sibling duo, led the way offensively on Thursday. And with standout middle Monique Huber sidelined due to injury, rookies Hanna Hieltjes and Teagan Johnstone were thrust into the fray – Hieltjes stepping into the starting lineup, and Johnstone playing her first points of the season off the bench. Gilray was happy with the performance of both youngsters, and was particularly pleased to see Johnstone back on the court after enduring a shoulder injury early in the season. The University of the Fraser Valley men’s volleyball team defeated their crosstown rivals from Columbia Bible College on Thursday evening, guaranteeing themselves a PACWEST semifinal berth in the process. On paper it looked like a mismatch – the favoured Cascades coming in with the No. 6 ranking in the CCAA national poll, and the Bearcats still in search of their first league win of the season. And though UFV (16-7) took care of business to lock up the PACWEST’s No. 2 seed and the first-round playoff bye that comes with it, CBC (0-23) challenged them in each of the three sets, all of which ultimately went the Cascades’ way by scores of 25-21, 25-22 and 26-24. The two teams wrap up the conference schedule on Saturday at UFV’s Envision Athletic Centre (7 p.m. start, webcast at pacwestbc.tv). Cascades fifth-year standout Joel Kleingeltink will be honoured in a pregame Senior Night ceremony. “I didn’t think we had our strongest game,” UFV head coach Kyle Donen said afterward. “Their crowd definitely posed a challenge for us in some ways, which was good. It was the right kind of match for us to have – to play in that atmosphere, preparing for what’s to come at provincials. Donen’s primary cause for concern was his team’s service-line showing – the Cascades managed to miss 14 serves, a large number for a three-set match. Kleingeltink was the exception to that team trend, pounding four aces including one for the winning point in the third set. He added 14 kills. Other UFV standouts included libero Isaiah Dahl, who had 16 digs, and setter Adam Frederickson, who had a solid night at the controls of the offence. 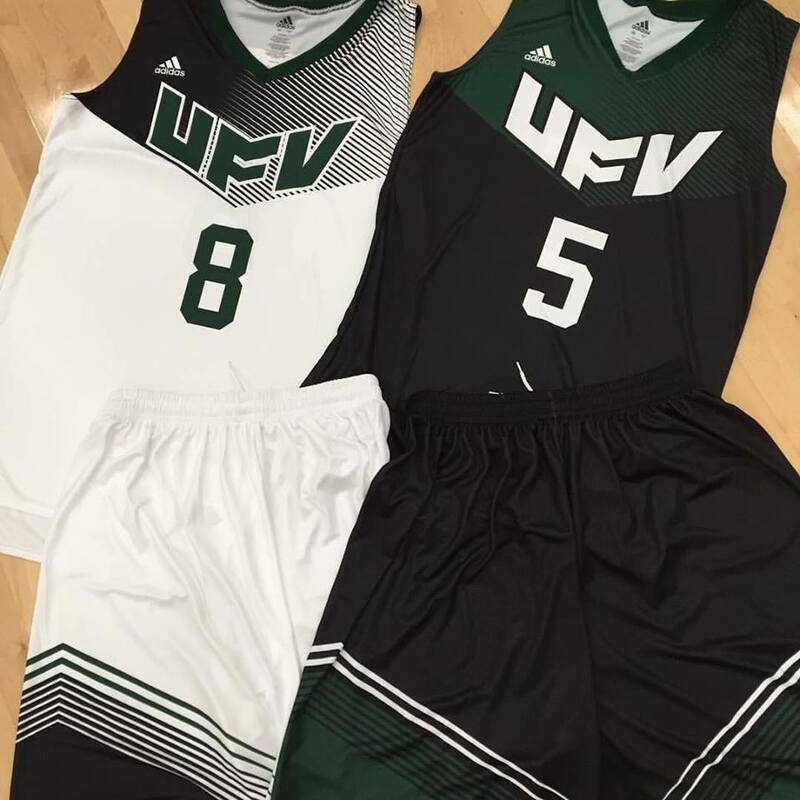 Be the first to comment on "UFV Sports Thursday – Hoops Playoffs And Volleyball"